"Facts. We want facts. Please give us the facts." That is the cry I hear again and again from people who feel assailed by claim and counter-claim about what it will mean if we vote to leave or remain in the EU. Many voters feel baffled, dazed and angered by the confident, yet contradictory, assertions of the two sides in this debate. I tell them: "Sorry. No can do. I am not able to give you the answers you crave." There can be no facts about the future, only predictions. Having said that, though, there are some facts when it comes to the past. That is why my producers and I have spent weeks trawling the archives as well as talking to some of today's political leaders for a two-part documentary about just that - the remarkable story of Britain's troubled relationship with Europe. I've been trying to discover why one question has divided the public, torn apart political parties, felled prime ministers and baffled, bemused and angered our neighbours for decades - does Europe mean "them" or "us"? The ambiguity in our attitudes began with and was embodied in the father of the idea of a United Europe. He was not a Frenchman, a Belgian or a German but the man who would go on to become the globally recognised and revered symbol of British exceptionalism - Winston Churchill. Long before World War Two - but with memories still fresh of World War One - Churchill argued for a United States of Europe. As our wartime leader, he proposed something unthinkable now - the creation of an "indissoluble union" between Britain and France with "joint organs of defence, foreign, financial, and economic policies". The British government signed up, rejecting only one part of the plan: a single currency. However, the French turned it and us down, not for the last time. After the War, Churchill once again argued Europe needed to unite, though to this day historians still argue about whether he saw Britain as a player or spectator, partner or sponsor in the grand project he advocated. The leaders of post-War France and Germany wasted no time in pursuing the goal he had argued for so passionately. His successors first sat on the sidelines and scoffed at the idea Europe would ever get its act together. First the European Coal and Steel Community and then the EEC (the European Economic Community) were created. Next, they changed their minds and spent a decade pleading to join - only to be rebuffed by the French again. Finally, Britain did sign up to what everyone called "the Common Market", in 1973. Only two years later, we were arguing about whether we should leave again, in the first Europe referendum. In the four decades since then, that question has felt unresolved. Of course, my series, Europe - Them or Us, cannot present a single agreed historical truth. Looking back, just like looking forward, involves judgements too. However, let me reassure you that if you watch, you will not have to endure the "yah boo" of so much of today's debate. You will hear only from people who were there at the time - prime ministers, presidents, their ministers and advisers - about the decisions they took then. The decision we all now face is one of the most momentous the country will have taken since Churchill was at Number 10. It won't only determine whether we remain in or leave the EU. It could reshape politics for good. Lose the vote, and few can see David Cameron, despite what he says now, able to continue for very long as party leader and prime minister. Win it, and there might be fizz for him and his backers on referendum night - but his party will wake up to a giant hangover on the morning after. Those who wanted to leave the EU won't simply forgive and forget. "But why does this matter?" I hear you ask. For this very important reason - Cameron has pledged to quit before the next election. He may be another casualty of Tory splits on Europe or he may go at a time of his own choosing. No matter. Changed leadership rules will mean that, for the first time in this country's history, it will be the votes of 100,000 or so party members - not voters or, as in the past, MPs - who will choose his replacement and the next occupant of Number 10. Little is certain. Except perhaps this - if more people understood how we got to where we are now they might find it easier to decide where we should go next. That is one fact I am happy to offer to you. 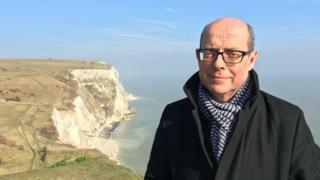 Nick Robinson is a presenter on BBC Radio 4's Today programme and a former BBC political editor. Europe - Them or Us is on BBC Two at 21:00 BST on 12 and 19 April and later via iPlayer. A version of this article is also appearing in the Radio Times.